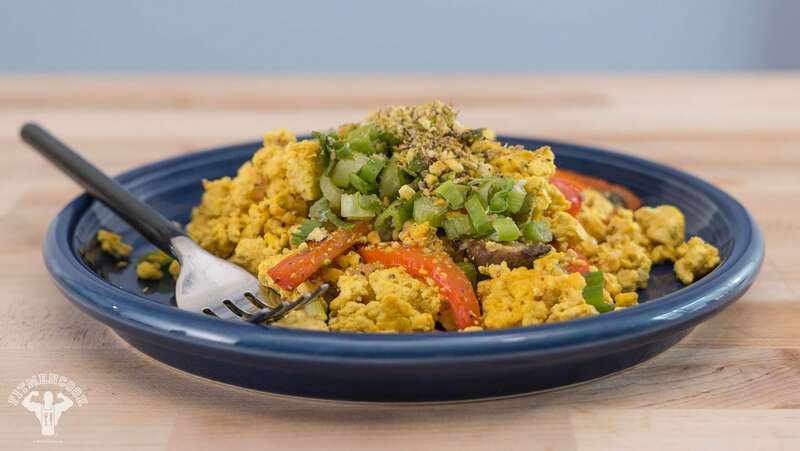 If you’ve never tried tofu scramble, you’ve gotta try it at least once in your life! If anything to see if it’s something you actually like – you may surprise yourself. The texture is very similar to eggs so it won’t seem “foreign” or unfamiliar in your mouth. One of the best things about tofu is that it really absorbs and enhances the flavors of the foods you cook it with so you can toss in your favorite veggies for a nutrient dense plant-based treat. Top it all off with some seasoned crushed pistachios or your favorite vegan cheese, and you’re good to go! Remove the tofu block from the packaging and place it on a paper towel. Place another paper towel on top and then gently place a skillet (or similar moderately heavy object) on top in order to squeeze out excess water. All the tofu to set for 15 minutes. Remove the paper towels, then crumble the tofu into a bowl or plate using a fork. It should look like scrambled egg whites. Set aside. Set a nonstick skillet on medium heat and then add olive oil, garlic and red onion. Caramelize the onions and flavor the oil for roughly 3 minutes. Add bell pepper and mushrooms and cook for roughly 6 minutes or until there are visible sears on the edges of the pepper and mushrooms. Toss in the tofu and sprinkle in the seasonings. Fold and mix everything together using a wooden or silicon spatula for roughly 5 – 7 minutes, then set aside. In a mortar or bowl (or small food processor/blender), add the ingredients for the topping. Mash using a pestle or food mallet, or gently pulse blend (DO NOT pulverize this into a powder). Add the tofu to a plate and garnish with green onion and a tablespoon or two of the crushed pistachio topping. Oh, and hot sauce too!